In many waters, summertime bass fishing means deep bass fishing, and deep often means 20 feet down or more. Getting bass to bite at that depth isn’t so much of a problem. We can do that. I mean, they still have to eat. The real problem is getting something down to them that looks realistic, something they’ll bite. I do that with the Molix Mike Iaconelli Lover Spoon. Over the last few years — maybe six or eight — structure spoons have come into vogue, and for good reason. They get down quick and, if they look like a dying baitfish, they’ll attract bites. The thing is, though, most structure spoons are nothing more than a hunk of metal shaped like a baitfish. They aren’t what I would call top-shelf. That’s where the Lover is different. We designed it with a very precise curve to the body. The importance of that can’t be overstated. You see, most structure spoons drop straight down, like a rock. Because they don’t look and act like a dying baitfish they don’t do a very good job of catching bass. Dying baitfish don’t drop straight to the bottom, tail down. They struggle. They wobble. And so does the Lover Spoon. We also put two hooks on it. We also put two hooks on it. One is on the back just like with ordinary structure spoons. The other is on the underside of the body near the nose and it’s held in place with a tiny magnet that lets it break loose at just the right moment — when the bite happens. This avoids hangups and makes for a better hookset. The other great thing about these spoons is that you can cast them. Most of the time I cast mine out past my target and let it fall on a semi-slack line. I don’t do anything except watch my line for that telltale twitch. The lure itself will do all that’s needed to look real. Sometimes, if the bass are a little lethargic, I’ll pick it up and let it fall back down two or three times. Never forget, however, that the fall is what this technique is all about. Bring it up slow or fast — sometimes that will make a difference — but almost all of your bites will come when it’s falling. Pay attention to what’s going on. Don’t miss a big one. That said, it’s also important to stay alert when you wind a Lover Spoon back to the boat because they swim as realistic as they fall. Sometimes, especially when the bass are actively feeding, they’ll chase one of these spoons down. I strongly recommend you do your best to match the hatch with both size and color. Bass intuitively sense what should be dying and what looks weird or out of place. Lover Spoons come in two sizes and several colors that make that fairly simple. Put the odds in your favor this summer. Pick a structure spoon that acts and looks like the real thing. Listen to Mike introduce and describe the Lover Spoon. 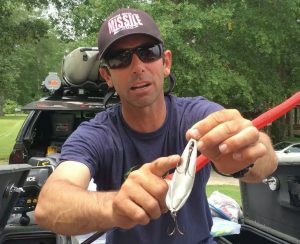 Hear Mike explain the Lover Spoon in a presentation he did for BassU.tv, the on-line video platform for exclusive bass fishing instruction from The Bass University. Watch the Lover Spoon drop. See Mike’s trip to Italy when he and the Molix crew developed the Lover Spoon. Like Ike on Facebook, and follow him on Instagram and Twitter to see weekly Vlog for Going Ike episode, along with fishing and fun content.